Little Office of Research Integrity (LORI) - OUR MISSION Canada currently has no independent office to investigate cases of research misconduct in universities. Under the current system, investigations are carried out by the researchers' own institutions. Naturally, they have an inherent conflict of interest and often falsified research records are left uncorrected. As a result, the scientific community can be misled for years by such falsified results. Canada's federal granting agencies (e.g., NSERC) cannot challenge the institution's findings or its decisions in such cases. We believe science is too important to be left to university administrators. LORI has been created to bring to light instances of research misconduct independent of institutions. LORI's sustained efforts in recent years have resulted in successful retractions of many scientific papers that were funded by the Canadian Space Agency (CSA) and the Natural Sciences and Engineering Research Council of Canada (NSERC). Ideally, these papers should have been retracted by the institution involved. Our mission is to demonstrate how ineffective the current system is in correcting scientific records. We believe that this will stimulate discussion and would hopefully lead to the establishment of an effective central agency to deal with research misconduct, independent of universities. More about the site here An article in the CAUT Bulletin puts it this way: “Indeed, these policies or "rules" may ultimately be simply cosmetically appealing, politically correct half measures that create the illusion a university is serious about assuring truthful and competent research. The "fraud" of implementing toothless internal regulations dealing with research misconduct and whistleblower protection within Canadian universities may be as bad as or worse than the misconduct itself.” (Harrell & Boisvert, 2011) LORI’s goal is to raise awareness of research integrity by presenting cases of research misconduct and following institutional response to responsible allegations of misconduct. Canada currently has no independent office to investigate cases of research misconduct in universities. Under the current system, investigations are carried out by the researchers' own institutions. Naturally, they have an inherent conflict of interest and often falsified research records are left uncorrected. As a result, the scientific community can be misled for years by such falsified results. Canada's federal granting agencies (e.g., NSERC) cannot challenge the institution's findings or its decisions in such cases. We believe science is too important to be left to university administrators. LORI has been created to bring to light instances of research misconduct independent of institutions. LORI's sustained efforts in recent years have resulted in successful retractions of many scientific papers that were funded by the Canadian Space Agency (CSA) and the Natural Sciences and Engineering Research Council of Canada (NSERC). Ideally, these papers should have been retracted by the institution involved. LORI’s goal is to raise awareness of research integrity by presenting cases of research misconduct and following institutional response to responsible allegations of misconduct. Our mission is to demonstrate how ineffective the current system is in correcting scientific records. We correct the records by analyzing data and presenting our conclusions in peer reviewed journals and at international conferences. We ask editors to retract published papers whenever we discover research misconduct or fraud that the university has long been aware of and yet has chosen not to report. In recent years, we have questioned the validity of the microgravity research data derived from the Queen's University Experiments in Liquid Diffusion (QUELD). These experiments were ﻿﻿funded for many years by the Canadian Space Agency (CSA) and by Natural Sciences and Engineering Research Council of Canada (NSERC). 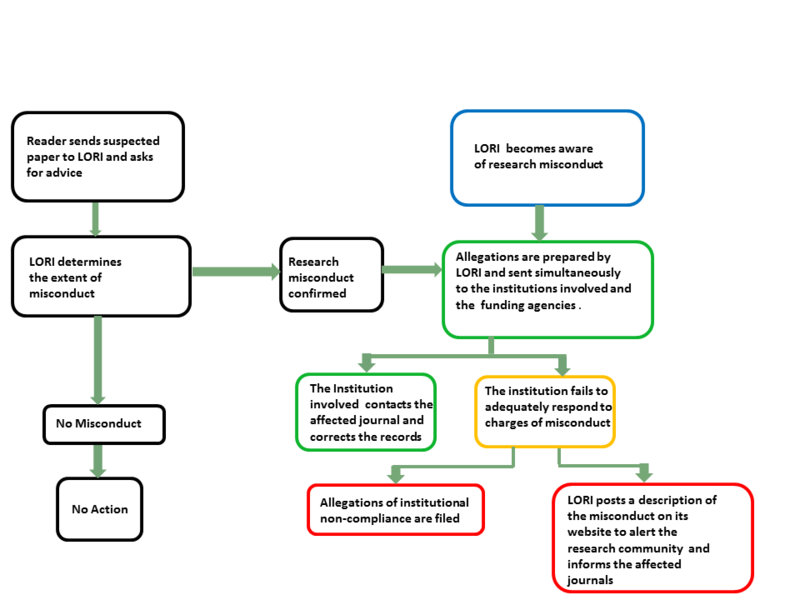 ﻿﻿﻿﻿LORI’s flowchart for correcting scientific records﻿ ﻿﻿has been developed based on our extensive experience with institutions, journals, publishers and NSERC during the last seven years. Liquid Metal Diffusion Measurements in Space: Errors Associated with the Non-isothermal Treatment of the Diffusion Couples (37th COSPAR Scientific Assembly. Held 13-20 July 2008, in Montréal, Canada). Media: "Study data from Queen's University update knowledge of aerospace research."